More than 500 high-profile global pulses heavyweights who arrived in Sri Lanka began finalising the Colombo Accord – the biggest milestone in the global pulses industry. The Accord, once concluded on 10 May, will cover colossal pulses transactions volume of $ 100 billion, the entire value of global pulses trades done annually. “I thank the Global Pulse Confederation (GPC) for choosing Sri Lanka to host this event in Colombo. 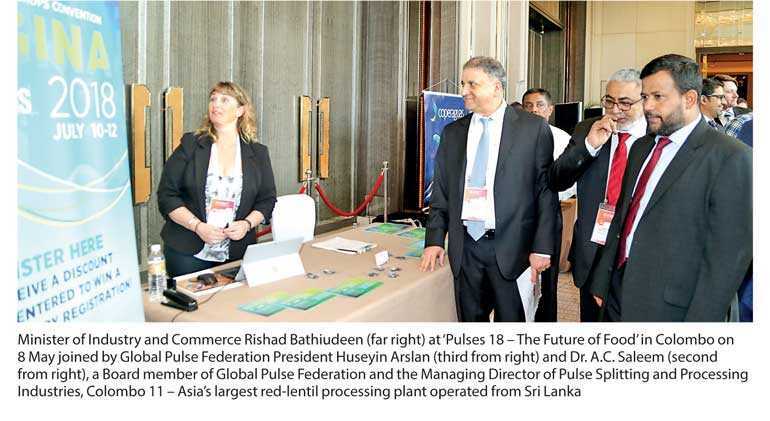 It’s an honour to us,” said Minister of Industry and Commerce Rishad Bathiudeen yesterday, addressing ‘Pulses 18 – The Future of Food,’ the latest in Global Pulse Confederation’s Convention series unveiled in Colombo on 8 May. More than 500 leading pulse and legume industry representatives from 40 countries are at this high profile, three day session which is expected to conclude with the Colombo Accord, the blueprint for industry growth involving production, consumption, trade policy and trade contracts of global pulses industry. “The Colombo Accord is the biggest milestone in world pulses trade history and a milestone in world food trade. The Accord calls for free and fair trade in global pulse industry. It’s in some way like the Uruguay round of WTO talks for this industry. We, the industry players, must be unified. This Accord is the blueprint for the GPC to strengthen the role that pulse crops play through their contribution to social and economic goals at national and international levels,” said GPC President Huseyin Arslan. “GPC members are committed to working together and with our partners across the value chain, to build knowledge and awareness to expand pulse crop production in countries around the world, increase pulse consumption in the diets of people and animals, foster predictable and transparent trade environments at the government and trade levels, increase order and discipline in pulse trade, and promote the use of GPC Contract that protects the interests of the entire value chain. The GPC will act to ensure WTO member countries’ trade policies on tariffs and quantitative restrictions are compliant with WTO obligations,” Arslan added. The new GPC Contracts mechanism will facilitate pulses buyer-seller contracts through GPC rather than directly between the buyer and seller, thereby reducing transaction irregularities and enabling effective arbitrations, if any. Globally, pulses are the fourth leading item in the world’s annual grain and pulses output-after corn, wheat and rice. Annual global pulses trade is at $ 100 billion. Pulses are increasingly considered as a sustainable superfood due to their multiple benefits, and their production levels too are unable to keep up with the increasing demand for them.